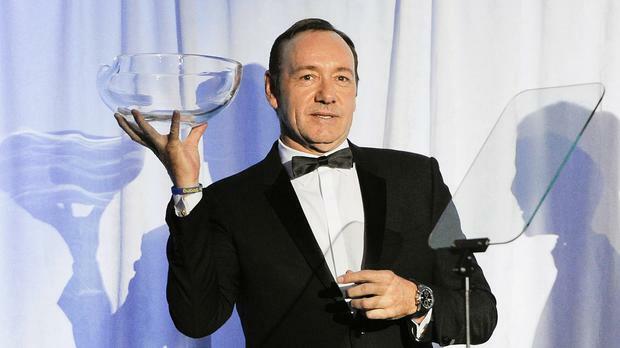 Kevin Spacey was emotional as he talked about his late mother while he was honoured for his career in the US. The actor was presented with a glass trophy as he was honoured for his work at the Museum Of The Moving Image's Annual Salute in New York. He struggled to control his emotions as he spoke of two of the most important people in his life, his mum and late actor Jack Lemmon, who was the person who told him he should move to the Big Apple and become an actor, reported Variety. Kevin told the audience: "I have been enormously lucky. I had a mother who was artistic who believed in the arts and exposing her children to the arts. I lost my mother 11 years ago but there's not a day that she's not hovering somewhere, egging me on. My mother is a presence in my life and always will be." He praised Lemmon, saying: "Jack had a philosophy ... that he passed down to me, which is why I've done the work that I've done for the past 11 years at the Old Vic and Old Vic New Voices, and why I've created my own foundation. "'If you've done well,' he used to say all the time, 'if you've done well in the business you want to do well in, then it is your obligation to spend a good portion of your time sending the elevator back down'." Several of the actor's past co-stars were at the event, including Kate Bosworth and Samuel L Jackson, with some paying tribute to the star. Clips from some of his movies were also shown, including American Beauty and The Usual Suspects. According to The Hollywood Reporter, Kevin, 54, said it had been a while since he had seen some of them. "I haven't seen most of those f***ing clips since the screening of those movies when they first came out," he revealed. "And so, I'm having kind of a 'Wow, I haven't seen that f***ing scene in ... 25 years'." Kevin follows in the footsteps of stars like Clint Eastwood, Tom Cruise, Sidney Poitier, Julia Roberts and Steven Spielberg, who have previously received the salute. By Craig Simpson, Press Association Fans will have to wait to find out the name of the 25th instalment of the long-running James Bond franchise. By Kerri-Ann Roper, Press Association Entertainment Editor Oscar winner Rami Malek, Captain Marvel star Lashana Lynch and Game Night actor Billy Magnussen will all join the cast of Bond 25, director Cary Joji Fukunaga said.